Infidelity turns your world upside down. Our time-tested process walks you through the steps to find a new normal. After an affair, your emotional, physical, and spiritual selves are shattered, leaving you hopeless. Affair Recovery is here to give you reassurance that hope does exist. Our own personal experience, and the experiences of the hundreds of couples we have helped, show us that there is a path to recovery. Our company founder, Rick Reynolds, LCSW, holds a Master's Degree in Social Work and is a clinical member of the American Association of Marriage and Family Therapists. Before you can make a plan, you need to understand the specifics of your unique situation. Our free Affair Analyzer asks about 10 questions to provide insights about the type of affair you experienced. Depending on whether it was an unfaithful husband or unfaithful wife, a single sexual encounter or multiple meetings, in person or via the internet, we can give you specific steps for moving forward. If you’re like most people, you have a million questions rushing through your head. Why did this happen? How will I ever be able to trust again? Is there hope for my marriage? Where do I go from here? How can I be sure it’s over? And will we ever be able to love again? We have a vast collection of articles, videos, and newsletters that explore the complicated aspects of betrayal, infidelity, forgiveness and recovery. 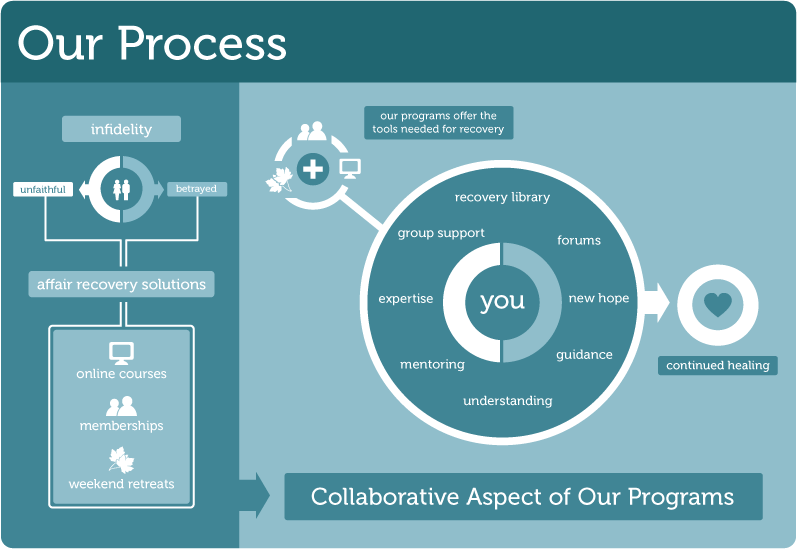 The Recovery Library holds our extensive knowledge bank of videos, audio recordings and articles about affairs, infidelity and healing. Monthly membership also gives you access to our anonymous forums, as well as the opportunity to have Rick answer your specific questions each week. EMS Online (for couples) and Harboring Hope (for the betrayed spouse) are based on a proven workbook and streamed video curriculum combined with the power of an online support group. Each week, you’ll do work on your own before discussing the week’s topic with your group on a private conference call led by our trained facilitators. Held outside Austin, Texas, our Emergency Marital Seminar (EMS) put you and your spouse in the company of several other couples who have also experienced infidelity. Led by infidelity professionals, our seminars create a safe place for you to talk about what has happened and figure out a plan for healing. Whichever plan you choose, know that it won’t be easy. We like to say that healing and recovery are pain with a purpose rather than pain with no progress. In the process of your class or retreat you’ll learn more than you ever thought possible about yourself, your mate, and your relationship. you might have an additional discovery period, where facts and information come out, before you move on to a stabilization period, where you learn to communicate honestly and openly with your mate and find hope. After your 13-week class or weekend retreat is over, how do you make sure that you and your spouse continue to practice the techniques and lessons you’ve learned? 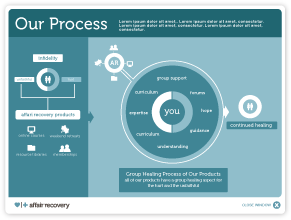 Many of our small class groups decide to keep connecting with their group each week for a year or more using aftercare materials provided by Affair Recovery. These tight-knit communities have the potential to create accountability and support and reinforce the lessons from the program. This helps to prevent relapse and ensure strong marriages. Don’t know how to get on a path to recovery? Can’t keep your thoughts straight to make a plan? Don’t worry. We’ve made a step-by-step guide. Our free, anonymous Affair Analyzer provides insights that will help you understand your particular situation and move forward in your recovery.